Need a getaway after the wedding, but the honeymoon is far away? 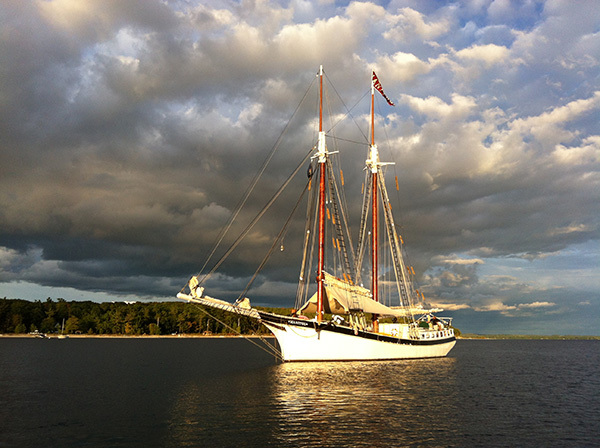 Enjoy one of these Michigan escapes. Sometimes, before the big honeymoon, a romantic getaway is more convenient and practical for newlyweds. A well-deserved break from executing the perfect wedding, a mini-moon in the Great Lakes State is just what a couple needs to relax and enjoy the start of their next chapter in life. 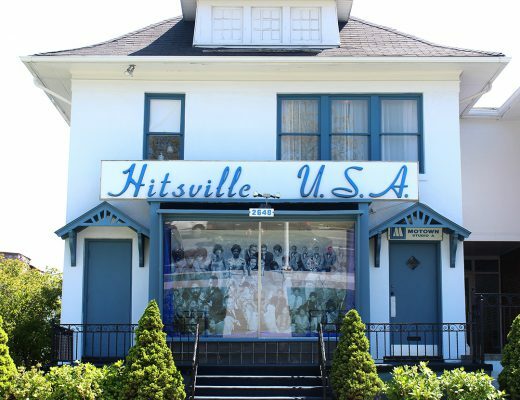 Michigan offers a range of destinations for every budget, season and interest. Be active, be lazy — eat, drink and be married. Here are five fun and fabulous cities to consider. 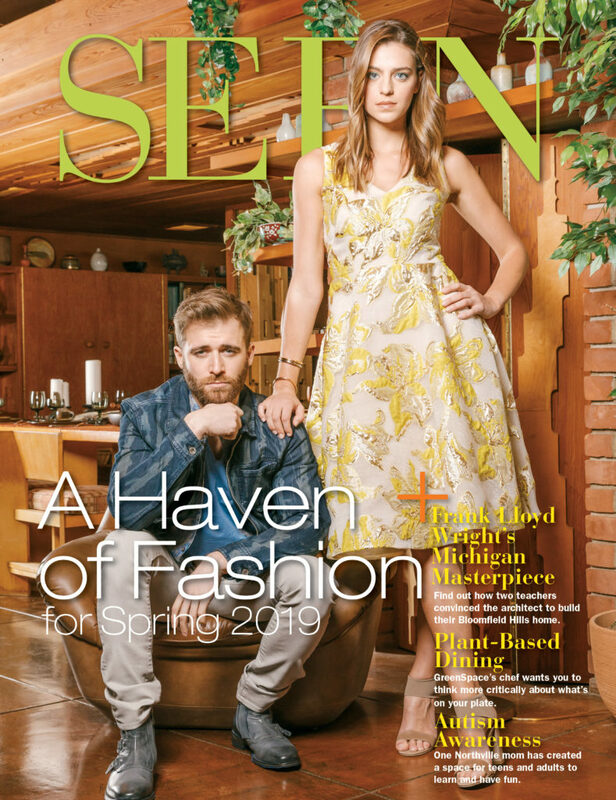 If Michigan were a dessert, then Traverse City would be the cherry on top, which makes sense, considering it’s the “Cherry Capital of the World.” Every season has its rewards. Couples can bundle up for a snowy adventure in winter, inhale sweet cherry blossoms on a spring tour, feel warm sand on the soles of their feet climbing dunes in the summer, or taste-test the wine trails through the fall. 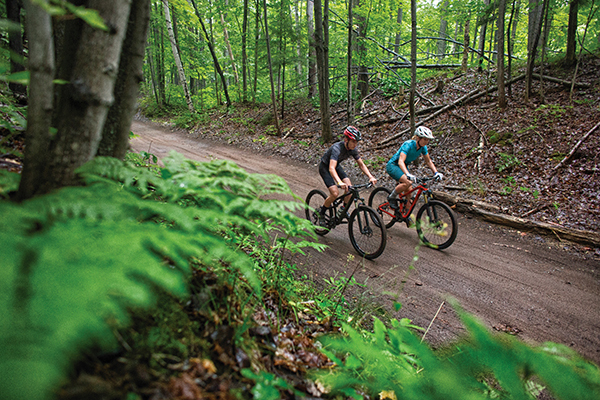 Traverse City packs the best life can offer into this Northern Michigan oasis. Chateau Chantal in Traverse City. Stay: Wellington Inn Bed & Breakfast, 231-922-9900, wellingtoninn.com; Tamarack Lodge, 877-938-9744, tamaracklodgetc.com; Chateau Chantal, 231-223-4110, chateauchantal.com; Grand Traverse Resort and Spa, 231-534-6000, grandtraverseresort.com. Eat: Patisserie Amie, 231-922-9645, patisserieamietc.com; The Little Fleet, 231-943-1116, thelittlefleet.com; Amical, 231-941-8888, amical.com. 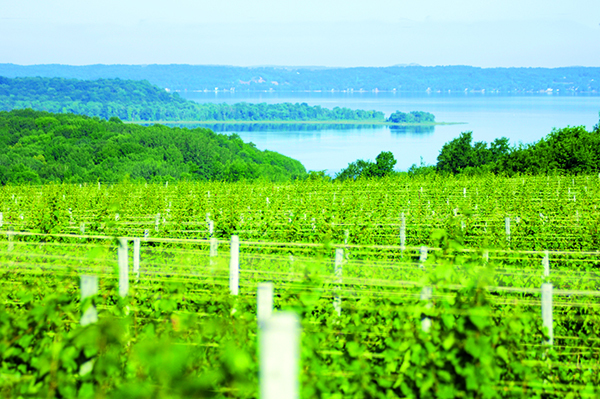 Experience: Old Mission Peninsula Wine Trail, wineriesofomp.com; Leelanau Peninsula Wine Trail, lpwines.com; Traverse Tall Ship Company (day tour on the Manitou), 231-941-2000, tallshipsailing.com; Sleeping Bear Dunes, 231-334-2000, sleepingbeardunes.com. 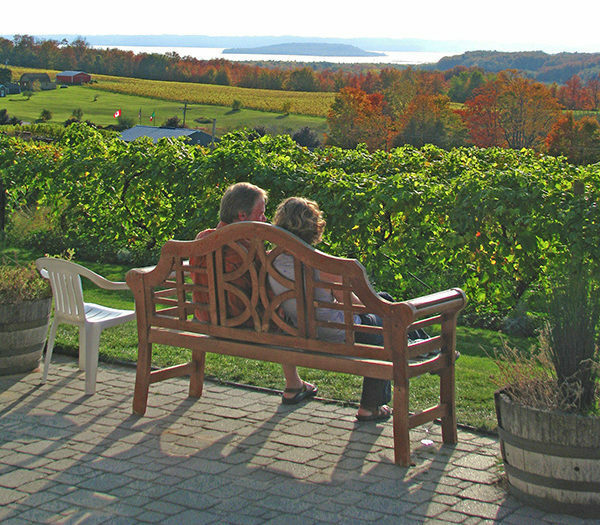 The view from Chateau Grand Traverse. 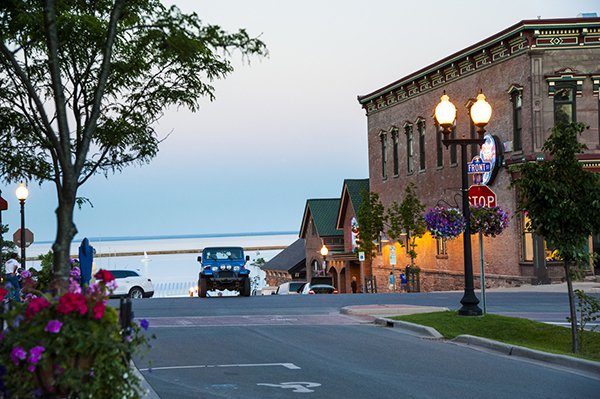 Romantic tip: Stop at the Lake Michigan Overlook along the Pierce Stocking Scenic Drive in Sleeping Bear Dunes, and stroll Front Street in the early morning as the shops begin to open. Fall colors are extreme, ice caves are amazing, northern lights are bright and the year-round magic of Marquette is pure Michigan heaven. A college town with craft breweries, excellent eateries and the state’s best waterfalls — this UP destination is a perfect place to “get back to nature” while enjoying the relaxed company of a new spouse. Stay: Landmark Inn, 906-228-2580, thelandmarkinn.com; Nestledown Bed and Breakfast, 906-273-0996, nestledownmarquette.com. Eat: Babycakes Muffin Company, 906-226-7744; The Marq, 906-273-2069, marqrestaurant.com; The Delft Bistro, 906-273-2455, thedelftbistro.com; Iron Bay Restaurant & Drinkery, 906-273-0990, ironbaymqt.com; Donckers (chocolates and confections), 906-226-6110, donckersonline.com. 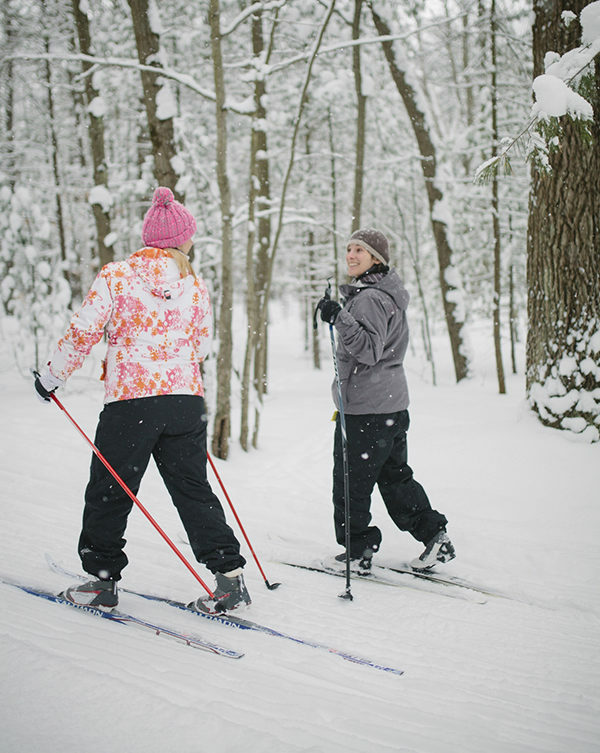 Experience: Hike, bike, ski, snowshoe, boat — rentals and information available at Down Wind Sports, 906-226-7112, downwindsports.com; U.S. National Ski and Snowboard Hall of Fame, 906-485-6323, skihall.com; Marquette Maritime Museum and Lighthouse, 906-226-2006, mqtmaritimemuseum.com. 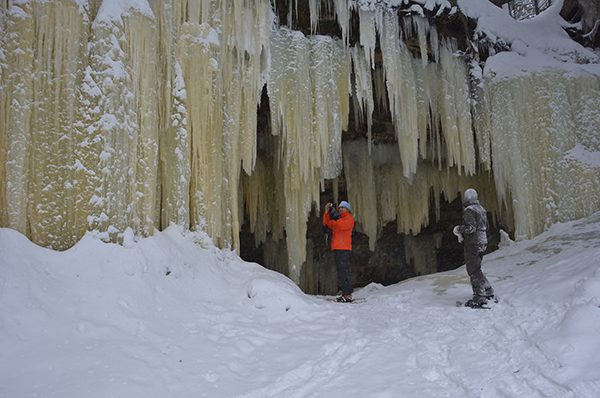 The Eben Ice Caves near Marquette. Romantic tip: Outdoor adventures during midweek offer a more secluded experience for couples. Make sure to pick up handmade candy from Donckers for an after-dinner treat. 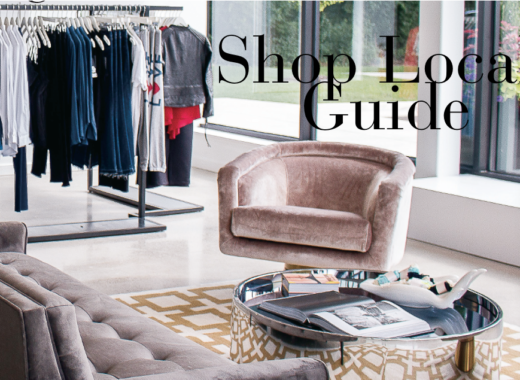 This budget-friendly destination north of Grand Rapids is the heart of a collection of smaller communities where life can be enjoyed all four seasons of the year. 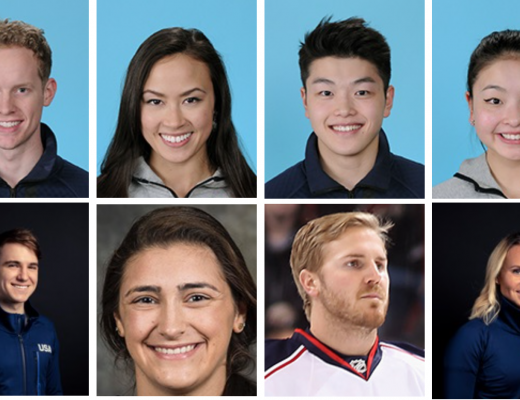 Ride a roller coaster in the spring, relax at the beach in the summer sun, dance to music at a fall festival or learn to luge in the crisp winter air — all in Muskegon. 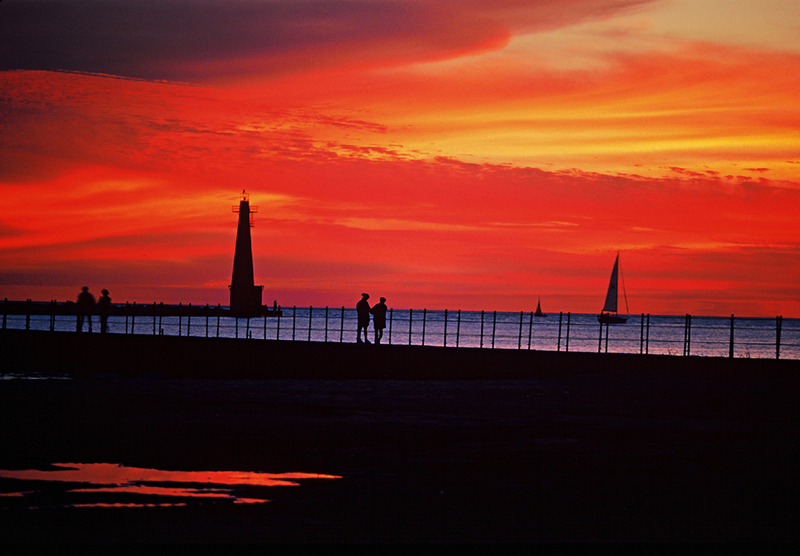 Glowing sunsets wind down every evening on the eastern shores of Lake Michigan. Stay: Shoreline Inn, 231-727-8483, shorelineinn.com (book a corner penthouse room); Lake Michigan Cottages, 800-870-3393, lakem.com. 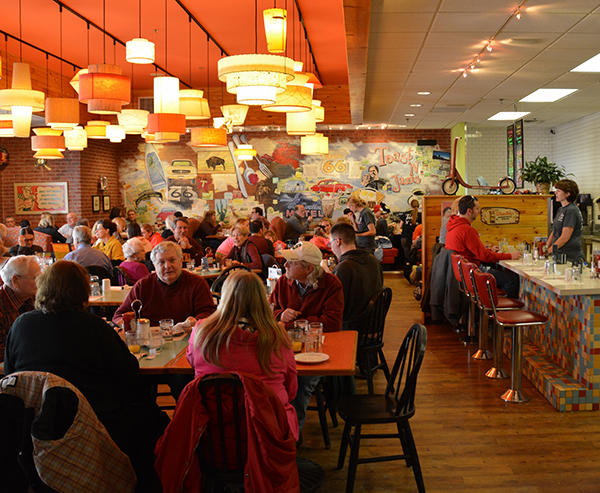 Breakfast at Toast ‘N Jams in Muskegon. Eat: Toast ’N Jams, 231-737-5267, toastnjams.com; Fatty Lumpkins Sandwich Shack, 231-760-4382; Unruly Brewing Co., 231-288-1068, unrulybrewing.com; The Lake House Waterfront Grille, 231-722-4461, thelakehousemi.com. 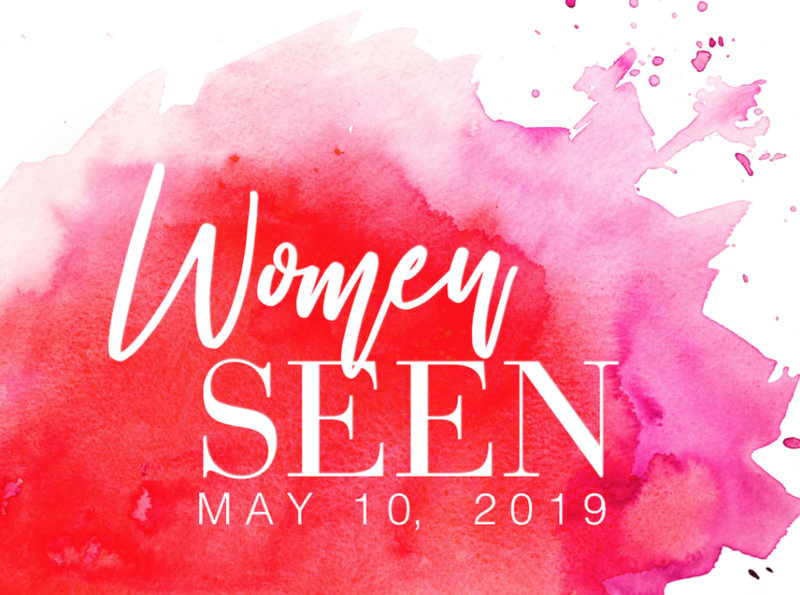 Experience: Pere Marquette Park, 3510 Channel Drive and Kruse Park, 3205 W. Sherman Blvd. ; Oceana Winery & Vineyard, 231-343-0038, oceanawinery.com; Michigan’s Adventure (Michigan’s largest amusement park and water park), 231-766-3377, miadventure.com. Romantic tip: Enjoy happy hour at The Lake House (ask for a window table), picnic at Kruse Park and motor along Scenic Drive to Whitehall (a must in the fall). Trendy art galleries and numerous B&Bs provide the platform for couples to enjoy scrumptious dining, shopping strolls and the rich character of the town. 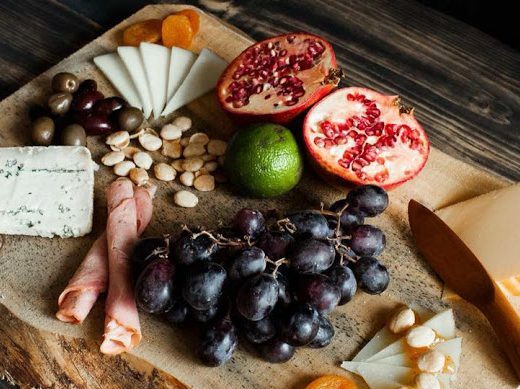 Artwork sprawls out of gallery and shop doors inviting visitors in, while around every corner a variety of food aromas tempt even the most meticulous eaters. Navigate the town by foot, chain ferry or even duck boat, but be sure to catch a sunset cruise to see the town (and the sunset) from Lake Michigan. 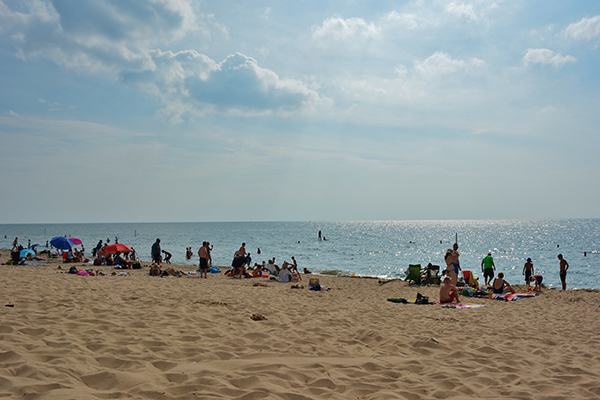 Saugatuck is an easy, stress-free getaway. It’s busy in the summer and quiet in the winter. 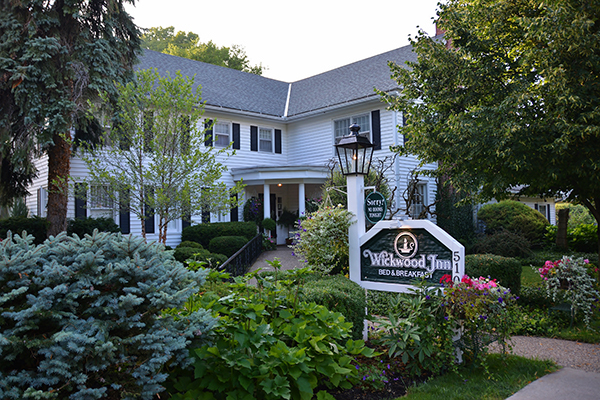 Stay: Wickwood Inn, 269-857-1465, wickwoodinn.com; Hidden Garden Cottages & Suites, 269-857-8109, hiddengardencottages.com; Saugatuck Landings, 616-635-1717, saugatucklandings.com. Eat: The Southerner, 269-857-3555, thesouthernermi.com; Marro’s Italian Restaurant, 269-857-4248, marrosrestaurant.com; Everyday People Café, 269-857-4240, everydaypeoplecafe.com. Experience: Oval Beach and Saugatuck Dunes State Park, saugatuck.com; Star of Saugatuck Boat Cruises, 269-857-4261, saugatuckboatcruises.com; Saugatuck Dune Rides, 269-857-2253, saugatuckduneride.com; Harbor Duck, 269-857-3825, harborducks.com; Velocity Adventures (paddle sports), 503-867-6293, velocityadventuretours.com. Romantic tip: Wander the town without purpose and let your senses guide you. 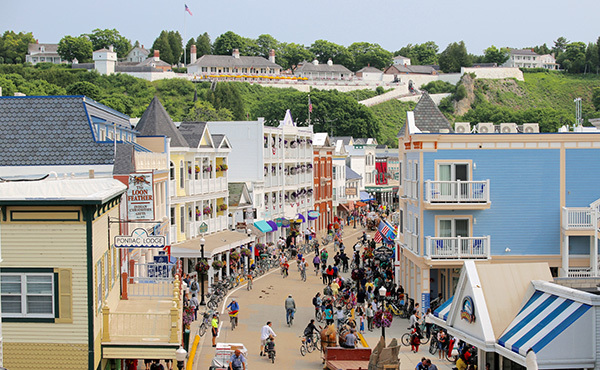 Always a top island pick, Mackinac Island is touristy in the downtown through the day but sparkles with new life as the “fudgies” ferry back to the mainland. 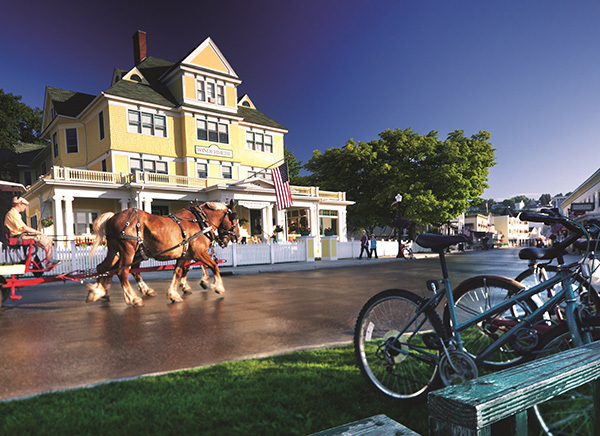 Stay overnight on the island, enjoy a horse-driven carriage ride, rent bikes, visit the butterfly house, follow your nose to the next fudge shop and meander as far as you wish. The island rocks spring, summer and fall, and really rocks at night. Ask locals for tips on the best bars for a particular night of the week, and navigate from place to place to the sound of music streaming into the streets. Stay: The Grand Hotel, 800-334-7263, grandhotel.com; Hotel Iroquois, 906-847-3321, iroquoishotel.com; Chippewa Hotel, 906-847-3341, chippewahotel.com. Eat: The Woods Restaurant (The Grand Hotel), 906-847-3331; Seabiscuit Cafe, 906-847-3611, seabiscuitcafe.com; 1852 Grill Room (Island House Hotel), 906-847-7222, 1852grillroom.com; Carriage House (Hotel Iroquois), 906-847-3321, iroquoishotel.com. Experience: Mackinac Island Bike Shop, 906-847-6337, bikemackinac.com; Original Butterfly House, 906-847-3972, originalbutterflyhouse.com; Fort Mackinac, 231-436-4100, mackinacparks.com; Mackinac Island Carriage Tours, 906-847-3307, mict.com. 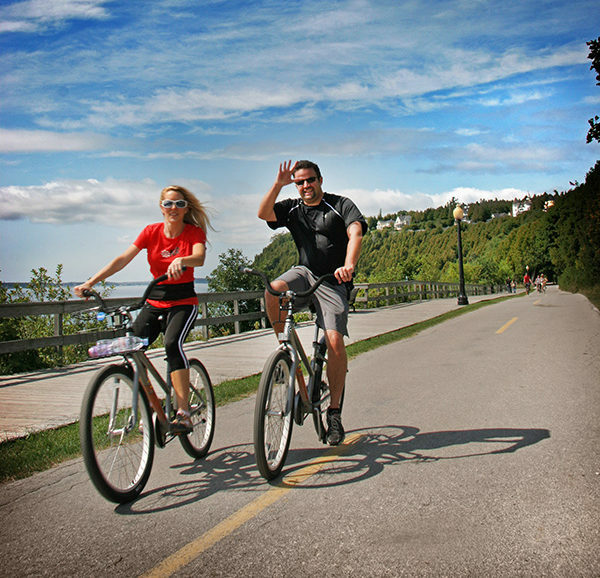 Romantic tip: Rent bikes with a handlebar basket, plan to picnic and circle the island clockwise (water to your left) which is opposite what most visitors do.